issued in 1997, retired in 1999; Retired mint condition with Original Tag, Boyd's Bears Hans Q Berriman. 6" plush bear #91392. 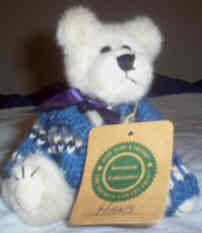 Adorable white bear with blue knit sweater and blue ribbon around his nec..
issued in 1997, retired in 1999; Retired mint condition with Original Tag, Boyd's Bears Hans Q Berriman. 6" plush bear #91392. Adorable white bear with blue knit sweater and blue ribbon around his neck. Issued in 1997 and retired in 1999. Great addition to your collection!